Pass the ball to win. Run the ball to win. Run and pass the ball to win. The Bulls offense has used all three models this year. The latest? Running for 307 yards to beat Central Michigan. It’s a good sign that this team can adapt to a different approach each week. Sometimes that’s based on the opponent, sometimes the health of the Bulls players, and sometimes on just who’s hot. 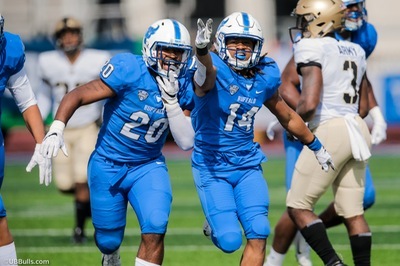 Facing CMU’s #6 NCAA ranked passing defense, and without Anthony Johnson, the Bulls unleashed freshman running backs Kevin Marks and Jaret Patterson. Earlier this season, it was the passing game that carried the team to wins over Temple and Eastern Michigan. The Rutgers win was a combination of both. This week, against Akron’s #2 MAC rushing defense, maybe it’s the passing game again. The Bulls average 223.7 yards passing per game. Their run total is 175.0. That’s a difference of 48.7 yards. That puts them right with the top balanced offenses in the MAC. Ohio’s differential is 47.8. Toledo’s is 56.8. The Zips, due to their struggles to run, throw the ball for 108 more yards than they run. A balanced offense is hard for a defense to stop. Bull Session Trivia: This is one of my all-time favorite trivia questions, and I’m sure I’ve used it before. The Akron Zips mascot is a kangaroo. That makes Akron one of only two FBS or FCS football schools with a female main mascot. What other school has a female mascot? Marks (167) and Patterson (121) become the first Bulls teammates to top 100 yards in a game since Anthone Taylor and Jordan Johnson did it against Akron in 2014. They’re the first freshman to do it in 16 years…While running back may be the easiest position for a quick transition, let’s not overlook what both have done to quickly become huge parts of the offense. Marks is a redshirt, which means he had 2017 to watch and learn. Patterson arrived on campus in January as a greyshirt, and went through spring practice. That time has been valuable for getting the coaches comfortable with them, and helping the players understand what it takes to see the field…Marks’ 466 yards rank second in the MAC. His seven rushing TD’s lead the league, and rank 13th in the country…Patterson says the he and Marks want to be “James Starks and Branden Oliver 2.0.” I love the nod to Bulls history, and the comparisons in style and build are obvious. Patterson has already become friends with Oliver, who calls Jaret “my ‘lil bro” and texts him before every game…The big second half against CMU came with two new players on the Buffalo offensive line. Right guard Tomas Jack-Kurdyla left early in the third quarter. Right guard Paul Nosworthy was hurt early in the fourth. Jacob Gall went in at right guard, while Trey Derouen took over at left guard…Head Coach Lance Leipold says Anthony Johnson is “really trying” to get his hamstring ready to play. He’ll likely be a game time decision Saturday…It was good to see Tyree Jackson keep the ball and run for the first time since his return from injury against Akron last season. His 5-yard TD run was his first since the Florida Atlantic game last year…Jackson’s next TD pass will be his 18th of the season, and move him into a tie for 4th on UB’s single season list…For one week, he won’t be T3. Jackson will wear #41 Saturday to honor Solomon Jackson…The Bulls have scored nine touchdowns of 30 yards or more…I mentioned that Akron is second in the MAC in run defense, allowing 125 yards per game. They did just give up 208 to Miami last week. They have allowed only one 100-yard rusher in four games…It’s a strong front seven for the Zips. LB Ulysses Gilbert leads the way. He’s been 1st team All-MAC the last two seasons. He’s also scored two touchdowns, half of the Zips’ four defensive scores in the first four games…Safety Alvin Davis has the other two. His four interceptions lead the NCAA. But Davis won’t play in the first half, and maybe not at all. He was called for targeting against Miami, and that will force him to sit out the first two quarters. Davis suffered a concussion himself on the play, and his overall status is up in the air…Two senior cornerbacks (Kyron Brown, Darian Dailey) make Akron hard to throw on. But they are giving up 232 yards per game, including 214 last week to Miami’s Gus Ragland. Bullet Points: +8. That’s the Bulls turnover margin. That leads the MAC, and ranks 9th in the NCAA. The eight interceptions so far match the total from all of last year. The Bulls depth at cornerback has been a pleasant surprise. Tatum Slack started the year opposite Cam Lewis, and then Devon Russell took over. He led the MAC in passes defended, but then got hurt. Cam Lewis missed one game, too. Aapri Washington and Roy Baker have stepped in. Washington has started the last two, and had his best game Saturday with 5 tackles and an interception. Leipold says Washington “plays a lot like Lewis, lots of energy and competitiveness.” Baker plays a lot, and now the Bulls are five-deep at that important position…Lewis now has three interceptions, one off the MAC lead…Safety Brandon Williams has picks in the last two games…Khalil Hodge had “only” seven tackles against CMU. He’s up to 351 in his career, six away from 5th in school history…DT DeShondrick Foxworth made his first start, for the injured Chibueze Onwuka. The JC transfer continues earn more playing time by being solid against the run…Fellow DT Eddie Wilson had his first career sack against the Chippewas. Same for DE Myles Nicholas…The Bulls have 38 tackles for loss, an average of six per game…The Bulls will see Akron QB Kato Nelson for the first time. He took over as starter last year the week after the Bulls lost to the Zips. Nelson is an equally good runner and passer. He is 6th in the MAC in passing, 5th in total offense. Much like Tommy Lazzaro of CMU last week, he’ll run if his first reads are not open. Lazzaro hurt the Bulls with his legs, until they started to put a spy on the QB. Look for that to happen again…Because the Zips have struggled to find a steady running back, Nelson has been their leading rusher the past two games. Akron runs for only 109 yards a game and 3.3 yards per carry, both near the bottom of the MAC. Van Edwards is their leading rusher, but he had only 4 yards on 6 carries against Miami…It’s a deep and speedy wide receiver corp. Andre Williams leads in catches, yards and touchdowns. Nate Stewart is a big target, and Kwadarrius Smith is the deep threat…Backup tight end Maverick Wolfley is the nephew of former Orchard Park High School stars and Greater Buffalo Sports Hall of Famers Craig & Ron Wolfley…The Zips did lose their starting right tackle Brandon Council for the season two weeks ago. Veteran guard Kyle Ritz (35 starts) & tackle Trevor Brown (19 starts) are the anchors up front…The Zips lead the MAC in red zone scoring. They’ve scored on every trip. But that’s only six times, and with only two touchdowns. Akron has scored five non-offensive touchdowns. UB kicker Adam Mitcheson is on the verge of two important school records. Based on what he did at Central Michigan, it looks like he’ll get the chance. Mitcheson had tried only two field goals in the first five games. He made one, and had the other blocked and returned for a touchdown against Army. Because Leipold had been so aggressive with the offense on fourth down, Mitcheson wasn’t getting the chances and his confidence was lacking. But Saturday, he nailed both of his field goals and all four extra points. Mitcheson is two field goals from A.J. Principe’s school record of 44. He’s 25 points from Principe’s record for career points. If he keeps kicking like he did in Michigan, he’ll own both records very soon. Bull Session Trivia Answer: Delaware. They are the Blue Hens. The Zips mascot, Zippy, is a kangaroo with a pouch. Only female kangaroos have pouches.